Washington – Calling the move “highly unusual,” Sen. Richard Blumenthal on Monday weighed in on FBI Director James Comey’s decision to tell Congress that his agency may have found more emails from Hillary Clinton’s private server. 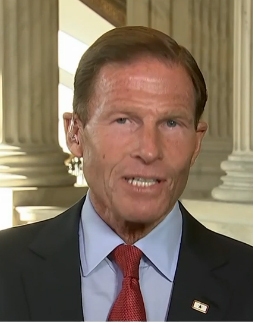 While stepping back from demanding Comey’s resignation, as some Democrats have done, Blumenthal said Comey has a lot of explaining to do about his “cryptic” comments. Comey rocked the race for the White House last week when he said emails pertinent to the closed investigation into Clinton’s email server were discovered on a computer belonging to former congressman Anthony Weiner, the estranged husband of top Clinton aide Huma Abedin. The emails were uncovered during an investigation into alleged sexting by Weiner to a 15-year-old-girl in North Carolina. For months, Comey investigated whether Clinton had used her personal server to receive or send classified information. He closed that investigation in July without recommending charges. Although it’s roiled their party, other members of the Connecticut congressional delegation have yet to weigh in on Comey’s decision to revive the controversy over Clinton’s emails. “The congressman is reserving his judgment until all the facts are out,” said Patrick Malone, spokesman for Rep. Jim Himes, D-4th District. Rep. Elizabeth Esty, D-5th District, said she was “stunned” by Comey’s disclosure. “But it’s something that’s beyond my control, so my focus is on making sure the voters are fully informed on my record in Congress,” she said. Other congressional Democrats were more outspoken. Sen. Majority Leader Harry Reid, D-Nev., said Comey may have broken the law, and Rep. Steve Cohen, D-Tenn., called for the FBI director’s resignation. “Comey’s recent public comments on former Secretary of State Hillary Clinton and her emails, apparently before seeing any evidence, and against the advice of the Justice Department according to press reports…make it clear that for the good of the FBI and the Justice Department, he should resign his position effective immediately,” Cohen said. Clinton also criticized Comey while she was on the campaign trail in Florida Saturday.